You are at:Home»August»August 28»August 28, 489: Who Was the First King of Italy? August 28, 489: Who Was the First King of Italy? On August 28, 489, the king of the Ostrogoths, Theodoric, defeated the forces under Odoacer, King of Italy, at the Battle of Isonzo, thus opening the route into the heart of Italy. Odoacer had become the first King of Italy in 476, but his downfall was preordained by his feud with the Eastern Roman Emperor, Zeno, who had promised Theodoric the Great (alternately spelled Theoderic) Italy in order to undermine Odoacer. After losing the battle at the Isonzo River, Theodoric defeated Odoacer again only 3 days later at Verona, causing Odoacer to flee to Ravenna. With much of his army having surrendered to the Ostrogoths, Odoacer’s days as King of Italy were numbered. Odoacer had become King of Italy in 476, having come from a background as a “barbarian” born child hailing from Pannonia, a region between Northern Italy and the Balkans. Not regarded as of “Roman” ethnicity, the true ethnic origin of Odoacer is not clear. In fact, he may have had a Hunnic, Slavic, or Germanic background, or something else, or very possibly a mix of ethnicities, perhaps even a Goth. His upbringing and early years are a mystery to historians, and considerable debate exists about his early adulthood. Odoacer may be known by different names in various old texts and references, and a story about him some time before 470 receiving a prediction from a holy many that he should go to Italy where his hide covered self would soon have riches. Coin of Odoacer, Ravenna, 477, with Odoacer in profile, depicted with a “barbarian” moustache. Odoacer at some point became an officer in the (remnants of) the Roman Army, apparently leading troops of various ethnic origins. With the remains of the Western Roman Empire a squabbling mess, Odoacer was allegedly the choice of dissidents to lead an uprising against Orestes, the then Western Roman Emperor in 475. After victories over Orestes, including killing the Emperor at Placentia and the Emperor’s brother at Ravenna, the Germanic “foederati” and his other troops declared that Odoacer was now ‘King of Italy.” On September 4, 476, Odoacer captured Romulus, son and heir of Orestes, but spared the youngster’s life. The Roman Senate, meanwhile, sent word to the Emperor of the Eastern Roman Empire, Zeno, that Zeno was now officially the chosen Emperor of the Western Roman Empire as well. Of course, Zeno was emperor in name only, as Odoacer had the military power in Italy. Thus came the machinations that resulted in Zeno “authorizing” Theodoric to invade Italy. 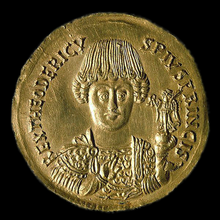 Medallion featuring Theoderic, c. AD 491–501. Note Germanic moustache and hairstyle, and possible elongated skull. Although many kings have died violently, by death in battle, by assassination, and violent accidents, it is rare for a king or other monarch to be slain by another king or other monarch. What other such incidents do you find interesting? Please tell us and if you wish, tell us the story behind the deadly deed. Cronin, Vincent. Italy: A History. New Word City, 2015. Dumoulin, M. The Kingdom of Italy Under Odovacar and Theodoric. Didactic Press, 2014. Parmalee, Mary P. A Short History of Italy (Illustrated). Amazon Digital Service, 2016. Next Article August 29, 708: When Were Coins First Minted?